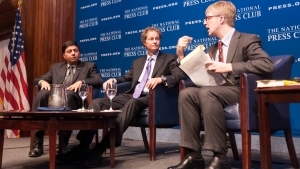 Professor Raj Sisodia (left) joins Co-Founder & CEO of Whole Foods Market, John Mackey (center) for a Book Rap moderated by 2010 NPC president Alan Bjerga, February 5, 2013. Mackey discussed his book, "Conscious Capitalism: Liberating the Heroic Spirit of Business." Businesses can be successful while also benefiting customers, employees and their community by consciously looking for ways to serve, John Mackey, co-founder and CEO of Whole Foods told a National Press Club audience Tuesday. Mackey and co-author Raj Sisodia, said they are hoping to persuade other business leaders of the value of conscious capitalism in their book, “Conscious Capitalism: Liberating the Heroic Spirit of Business." Past NPC president Alan Bjerga, who introduced the program, noted that  that Mackey has devoted his entire life to selling organic and natural foods and is credited with shaping the development of the organic foods sector. Organic foods account for about an eighth of the fresh produce market, he said. Mackey said many people see business as “selfish, greedy, and exploitative.” But "conscious capitalists" believe business can benefit all stakeholders by committing to a higher purpose besides simply making money and deciding to engage only in business practices that bring value not just to investors but to customers, employees, suppliers, and the community, he said. Whole Foods has located stores in neighborhoods of varying economic means, Mackey said. In some neighborhoods, the markets have sparked community revitalization, he said. Each store can set its own community serve agenda while also participating in company-wide projects, he said. The company will launch its The Whole Planet Foundation, its third charitable organization, later this year, Mackey said. The Whole Planet Foundation will create economic partnerships with people in developing countries that supply products to the stores, he said. The company will underwrite the administrative costs so that every dollar will go toward the programs, he said. Mackey in a spirited question-and-answer session declined to share his views on controversial political questions, such as immigration, but did explain his views on government and the role of organic foods. Businesses, he said, are best able to create wealth without over-regulation in health care and in other areas. Society as a whole needs to move to a higher consciousness that sees conflict as an opportunity for everyone to benefit, rather than as a zero-sum game, he said.